Don’t miss your opportunity to go on a Tuvan adventure by catching Alash perform for free tonight at the MCPL beginning at 7:00! “I wanted to say what an absolutely awe-inspiring afternoon and evening we experienced in Paoli. Throop (pronounced Troop) Elementary 6th graders watched Alash in wide-eyed amazement and asked insightful questions at their show, which was intimate and intensely personal. 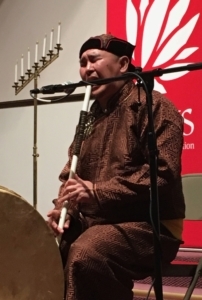 The trio of Alash shares the ancient art of Tuvan throat singing with Paoli audiences Tuesday. The Black Vulture folks, our collaborators, were generous of spirit and time, both at the school and at the church. Pastor Bob of the First Presbyterian Church was a wonderfully gracious host. The Lost River Co-op had so many people show up to eat that they ran out of food; and the food was delicious. 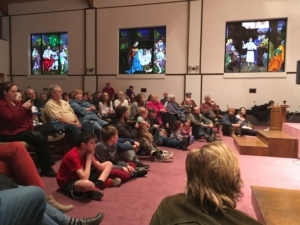 A sense of community pervaded both at the Co-op and at the church, where 155 attendees crowded in to watch Alash. And Alash delivered! While I was setting up sound at the church, someone noticed that my rear tire was low. Andy and Dave, from Black Vulture Project, took the car to a gas station and filled that tire with air and then noticed another tire about to blow. They changed the tire for me with a spare, which allowed us to get safely back to Bloomington. Kindness and grace were offered in abundance.